The data presented in this application is for representation use only and does not represent a survey. No liability is assumed as to the accuracy of the data delineated hereon. 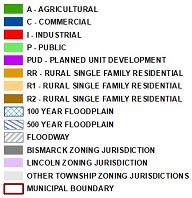 Contact Burleigh County GIS at 701-204-7748 with issues regarding data contained within this application.